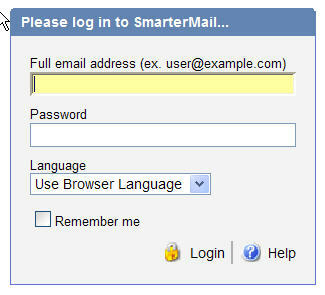 We've enabled SmarterMail 3® on all our email accounts. As with previous versions of SmarterMail, With SmarterMail, you can access your email accounts from anywhere you can connect to the Internet -- no special software (Outlook, AOL, etc.) is needed. This is available with all CyberInsights accounts at no extra cost. SmarterMail 3® offers a host of new features. You can now maintain your contact list, task list, and calendar on SmarterMail 3®, and you can add RSS feeds. We've updated our help menu for details on using all the SmarterMail 3® features. Take a look. You can use a combination of SmarterMail with other email programs (such as Outlook, Outlook Express, or Eudora). For example, if you like using Outlook while you're in your home or office, but want to be able to access email while you're away, you can do both! To access your email accounts, you simply type the URL http://mail.yourdomain.com into your browser (replace "yourdomain.com" with your own domain name, for example, cyberinsights.com). Do not include "www." While much of it is self-explanatory, there is an extensive help file available from the email screen, and from there you can easily send, receive, forward, and store your email, etc. Use the "Choose an Action" dropdown menu as well as the many options under the headings: Reports, Settings, Move To Folder, Sharing, etc. You can manage virtually all your email ptions including vacation messages, etc. from this screen. More detail on using SmarterMail is also available on our main Support page.